Wool and silk ready-made There are 127 products. Adept of comfortable and silky models made from noble materials such as wool and silk? This category is for you. Wool and silk garments are like a second skin, they transport you in a soft and comfortable universe for all occasions. 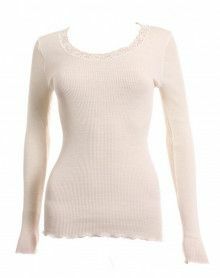 In lace or macramé, three brands offer luxurious ready-to-wear models in these warm and pleasant materials. OSCALITO is an Italian brand of fine lingerie that offers noble and refined blouses, tops and waistcoats since 1936. MORETTA also offers this combination of materials in different models of ready-to-wear in wool and silk sober and elegant. Finally, discover the collection exclusively reserved for the wool and silk models of the brand BARBARA. Choose clothes from wool and silk now and cut them close to the body.